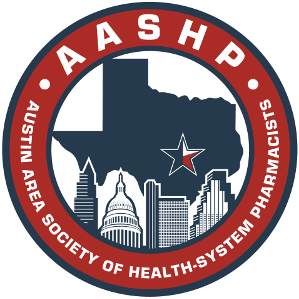 ​Thursday, November 15th, 2018: Daiichi Sankyo: The Impact of Iron Deficiency Anemia on Integrated Health Systems | Presented by David Long, Pharm D.
Wednesday, May 9th, 2018: Feraheme®​ (ferumoxytol injection) | Presented by Lakesha Farmer, PharmD with AMAG Pharmaceuticals, Inc.
Wednesday, December 2, 2015: "Treating cUTI and cIAI Caused by Prevalent Gram-Negative Pathogens"
Wednesday, October 21, 2015: "Taking Control of Platelet Inhibition in PCI"
Thursday, September 17, 2015: "Stroke Risk Reduction in Patients with Nonvalvular Atrial Fibrillation (NVAF)"
Wednesday, September 2, 2015: "Basal Insulin Therapy in the Treatment of Insulin Resistant Type 2 Diabetes: The Role of the Pharmacist in Ensuring Their Safe and Effective Use in Patients"
Wedesday, June 3, 2015: "Skin and Soft Tissue Infections: Got Pus?" Thursday, May 7, 2015: "Update on ACIP Recommendations for Pneumococcal Vaccination in Adults"
Wednesday, March 11, 2015: "Management of Pain, Agitation and Delirium in Mechanically Ventilated Patient"
Wednesday, February 11, 2015: "Combination Therapy for Severe MRSA Infections: Is Less Really More?" Wednesday, January 14, 2015: "Patients with ABSSSI: Introducing the first and only FDA-approved Single Dose IV Option"
Wednesday, November 5, 2014: "HIV Medication Therapy Management: Clinical Pearls for Pharmacy"
Wednesday, August 6, 2014: Updates in Lipid and HTN Guidelines: What's new and how does it change practice? Tuesday, May 8, 2012: "SEDATION: Sedation Education Demonstrating Advances in The Intensive Care and Perioperative Settings"
Tuesday, April 3, 2012: AASHP Social Event! Thursday, March 15, 2012: "Moving Towards Solutions for Common Issues in Health-System Pharmacy"
Tuesday, February 7, 2012: "Legal Issues for Pharmacists and Technicians"
"Thursday, January 12, 2012: "Current Issues in Toxicology - an Update for Pharmacists "
Tuesday, November 1, 2011: "Focus on hyponatremia: Understanding and Treating the most common electrolyte disorder"
Tuesday, September 13, 2011: "APEX: The Potential Role of Antibiotic Heterogeneity in Optimizing Antibiotic Selection"
Thursday, May 12, 2011: "Improving Pain Treatment in the Hospital Setting". Saturday, April 2, 2011: AASHP Social Event! Tuesday, March 8, 2011: "Managing Insulin Therapy in Special Situations"
Tuesday,February 8, 2011: "Pharmacy & the Future: A compliant, safe and sustainable approach to managing pharmaceutical waste "
Tuesday, January 4, 2011: "Update in Pharmacogenomics"
Tuesday, November 9, 2010 : "Safe and Effective Use of Insulin Therapy Through the Continuum of Hospital Care"
Thursday, September 16, 2010: "Pharmacy Law: Legislative Update"
Thursday, January 14, 2010: "Send In The Clowns: Humor and Compassion in Medicine"
Tuesday, May 12, 2009: "Prophylaxis of Deep Vein Thrombosis in Medical Patients with Severely Restricted Mobility During Acute Illness"
Thursday, April 30, 2009: "The Analog Difference". Wednesday, January 14, 2009: "Current Hospital Perspectives on the Use of Erythropoiesis Stimulating Agents"
Tuesday, May 22, 2007 : “A Blueprint for Growth Factor Therapy: Integrating Recent Evidence”. Tuesday, February 13 2007: "Acute Postoperative Pain Management"
Tuesday, January 9, 2007: Treatment Strategies with IV Anticonvulsants"
Tuesday, November 14, 2006: "PEDIGREE LEGISLATION and the Effect on the Pharmaceutical Supply Chain"
Tuesday, May 9, 2006: “ Emerging Options in the Management of Venous Thrombosis ”. May 13, 2003: "Acid Suppression in the Hospitalized Patient"